A file photo of a community deserted by residents after suspected herdsmen invasion. Several persons are feared killed following fresh violence in Taraba and Benue states, both in Nigeria’s North-central region. The attacks, which reportedly started in Taraba State on Wednesday, was said to have spread to Akaanya and Nenchi villages in Ukun Local Government Area of Benue State, leaving 10 persons dead. 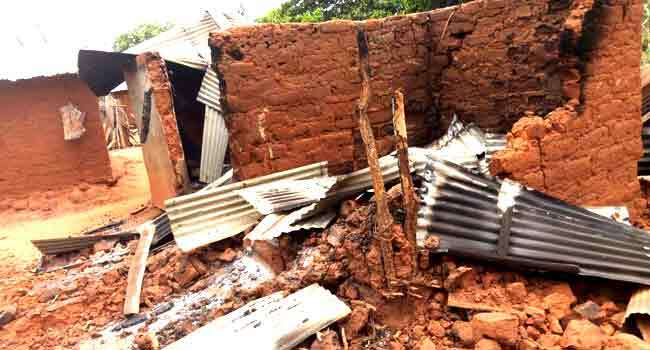 Chairman of Ukun LGA, Mr Tyokaa Iberlogo, confirmed the attacks to Channels Television on Thursday but said details on the incidents were still sketchy. Jandeikyula, a Tiv village in Wukari Local Government Area in Taraba State was allegedly the first to come under attack yesterday (Wednesday) evening, resulting in the death of more than 20 persons, including a soldier. Channels Television also gathered that more casualties might have been recorded as some of the villagers are said to still be missing. In Benue State, gunmen suspected to be armed herdsmen carried out a fresh attack on Agbo community in Makurdi, the state capital on Thursday. The attacks came a few days after the withdrawal of troops on Cat Race Exercise deployed in the region to stop the attacks by herdsmen on the communities in the North-central. Prior to the withdrawal of the troops, President Muhammadu Buhari had visited Taraba and Benue states to condole with the families of those who lost their lives in the wake of the herdsmen-farmers crisis in the region. Addressing Benue leaders in Markudi on March 12, President appealed to them to convince their constituents that the Federal Government was doing its best to end the recurring attacks by armed herdsmen. Responding, Governor Samuel Ortom urged the President to upgrade Exercise Cat Race to a full military operation. He noted that the attacks by armed herdsmen predated the current administration, stressing that the recent attacks have displaced more than 170,000 people with children of school age constituting 60 per cent.